One of my proudest moments of 2015, although it's a little early to call a whole year, has to be the Epic Hike that Betsy, Cal, Ethan and I had in the icy canyons of Turkey Run State Park on 1/2/15. We decided on Trail 3, marked "very rugged" but only 1.7 miles, about what we were looking for. The trails at Turkey Run follow and cross ravine stream beds multiple times, a fact that was not lost on me, having fallen literally into a creek the day before while crossing on icy rocks. My entire right side was soaked and I had to go directly back to the Inn letting the others continue their "moderate" warm up hike on our first day of arrival. I did have a very peaceful swim at the Inn's pool so I didn't totally regret it. Anyway, that Friday was a bit warmer day, as we crossed the suspension bridge which leads to the Rocky Hollow-Falls Canyon Nature Preserve and an abundance of wonderful and scenic trails, not to mention challenging. Betsy kept asking if this was the trail she had fallen on her behind and slid down a couple of years ago when she and I traversed it in a good firm snow pack of February. If it was, we had come through the opposite way, going down the ravine. This day we were headed up the ravine and the water was running but all the rocks and many other surfaces were slick with ice. A couple was ahead of us and turned a steep corner of rocks and disappeared while Ethan took copious pictures of icicles and minutiae he thought would make artistic photographs *we have yet to see any pictures from this professional grade camera he got about a year ago*. So, we begin struggling up the slippery rocks, all the time I am keenly aware of how cold I will be and how far from the Inn we are this time, if I fall into the creek again. We are already questioning our ability to keep going and the warning in the trail guide that this particular trail can be impassable in inclement weather, when the young, healthy, dressed about like we are, couple comes back down the ravine, saying, "Nope, you can't do it." We're like, "Really?" They're like, "Yep, you can't make it without going through the creek and we don't have boots." So, they pass back down the trail and disappear and I'm like, "I don't want to give up without even looking at what we're up against." We are now on a very wet, slick, pass but Ethan volunteers to forge ahead around the bend with Cal in pursuit. Betsy and I carefully continue on, hyper-aware of our middle age and health status, and that two whippersnappers just gave up. I have to admit I had the idea that I could will myself through this trail, and relished the challenge. Just the same I was a bit scared. I was last around the corner of lubricious rocks, gingerly and laboriously minding each step until I reached my companions who are eyeing said "impassable" part of the creek bed. Somehow we have to cross several feet of water (too far to jump), which is about a foot deep. We discuss possible strategies and while looking around for an alternative route, Ethan and Cal spy a large branch (ice covered, mind you) and decide we can make it into a bridge. They throw it down and don't have much trouble bouncing across, followed by Betsy hobbling over with a helping hand from her sturdy son. Now, it's my turn; I buck up and start across grabbing Cal's firm grasp about half way across, as most of the ice was on his end, and quite thick I might add. 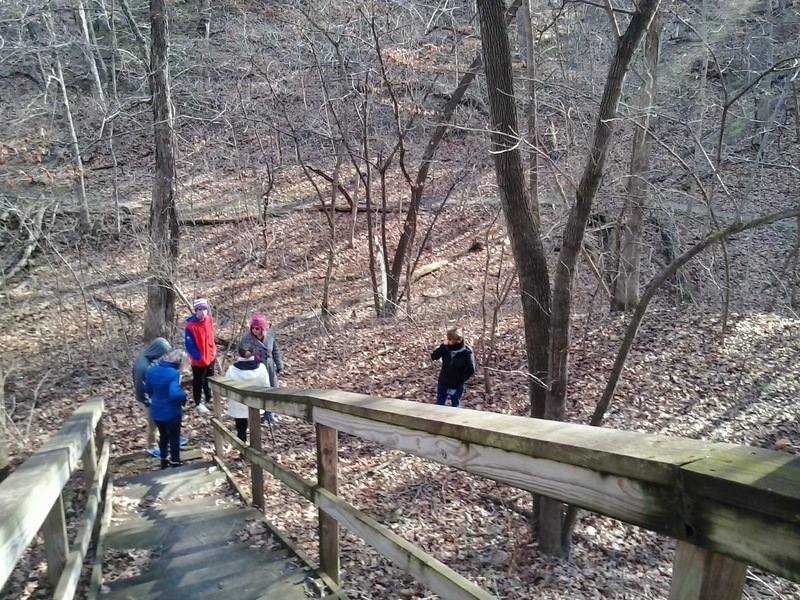 We are all ecstatic and continue up the ravine. We end up back on the other side of the creek shortly thereafter, and Ethan, Cal and Betsy, scale a rock wall on a ledge above the water, telling me all I have to do is keep my body pressed against the rock so I don't lose my balance and fall backwards into the creek. I put my first foot in the hold and mentally start freaking out. I can't do it. I can't make myself trust these slippery rocks to not send me into the creek on my head causing a major concussion and possible broken bones. Nope, not gonna do it. The team gives me encouragement and a pep talk, but I flat out refuse. Ethan is standing in the middle of the creek above me on a flat rock that is somehow jutting out above the water line, but I can't get there without scaling that wall. They start looking around again, and Cal has the brilliant idea we can bring the big branch up to this point and I can cross the creek on it, so Cal goes back down to drag the large branch back up. I side step across with an assist from Cal and we continue up the canyon, the next obstacle being to ascend a steep rock wall. Again, the other three make it up first, then Cal reaches down and drags me as I crawl upwards. From that point on, it remained rugged but passable. An older couple is coming the opposite way, and we warn them it's treacherous, but if they use the branch we left behind they should be able to make it through. Those are pretty much the worst looking legs ever. I wanted to explain something from my last post, that is, why did I call God "Bob" and "Free Booklet?" It's something my parents, especially my dad has been saying for years. First, Bob was the God of one of the planets in the science fiction novel "Hitchhikers Guide to the Galaxy," a book I have never read but my parents revere. As for Free Booklet, there was a commercial at one time stating, "The creator has a name. Few know it: Free Booklet." Ever since that classic quote, Dad has favored calling God, Free Booklet. As Betsy declared on Christmas Eve, I come from a long line of atheists. Well, not so much atheists as agnostics. Kind of odd, being that my father was raised by a God fearing, Bible toting, fundamentalist father and mother, and I don't mean that derogatorily. From all I know of my grandparents, they were the very best kind of Christian people, that practiced what they preached. They even took me to week long Revival Bible camp in Jamestown, ND. They would probably be horrified to know that 8 year old Susan was sneaking off to meet the caretaker's son, Brian Hettler, with whom I had fallen in love, and later claimed I would one day marry. So much for my religious training. My mom's family was more traditional Protestant eg. Methodist. My mom's interest in church was more having an outlet to sing in a choir or listen to an inspiring speaker, which was last apparently the case in 1968. My dad can quote the bible with more ease than anyone I have met, yet views it more as piece of literature. One day, he will meet Free Booklet and know all the answers. My world was rocked at the start of the 2013 school year. Not only did my caseload double, I had hundreds of new personalities to deal with, one of which quickly became intolerable to me. By Christmas I had lost 19 pounds, was working 50 hours a week, and commuting another 10, and I felt like a complete failure at my job. At the start of 2014, I was just beginning to get my feet underneath me and focus on one day at time without the constant threat of giving notice in the middle of the school year (almost completely unacceptable, however many friends close to the situation said they would not blame me). With the help of yoga, wonderful co-workers, exercise, my family supporting me, and aromatherapy shampoo and conditioner (I know it sounds weird, but it was sometimes the little things that got me through), I kept my head up at work and started looking for another job. I enjoyed Cal's last season of baseball at Spoon River, and counted my blessings while asking for the strength to manage each day in front of me. In an act of God, or Bob, or Free Booklet, or whatever you want to call a higher power, a job came open at my local hospital for a therapist around March. I quickly applied, if you can call several hours navigating the online application process quick, and had an interview pretty rapidly. Many of my old colleagues had left my old mental health center for this greener pasture. After my tenure evaluation in March in which I received Distinguished marks in every category, which I am not saying to brag, but to say I don't think my director was given the same direction as our union membership was (we were told that good teachers/support personnel should expect proficient ratings and perhaps an occasional distinguished rating under the new Danielson framework) or she just had an inflated view of my performance. After that was over, my director asked for a private meeting to discuss my caseload and rumblings she may have heard about my dissatisfaction. I decided to keep personalities out of it and was assured there would adjustments in my caseload, but I was honest and let her know I was pursuing other opportunities. She made it clear she would like me to stay, and soon two other social workers in the coop gave notice. As she began to interview for those positions, and I began to interview for other positions the tension mounted, and I began to get pressure to make my intentions known. I was being asked directly to say when and if I would be resigning and I finally caved in before I had a job offer in hand. Granted, I thought the hospital interviews went extremely well, but the weeks were going by and I didn't hear anything, and I refrained from asking my inside source what my chances were. I gave my notice and a week later I had the job offer I had been hoping for. Score one for me! I started the new job the Tuesday after my last day of school. I planned my last days to really leave my affairs and instructions for the new hires clearly ordered. I hope the new girls did find it this way. I was trained in my new job by the gentle man who hired me in 1996 for my first job in mental health. It was reassuring, comforting and delightful to work together again. However, my learning curve was pretty steep. The new software system and procedures were beyond mind boggling to me, and I struggled to feel adequate in my new role as a therapist and keep up with the paperwork (read computer work) end. It took a good 3-4 months of hard work to even begin to get up to speed. The only problem then was a 24 hour work week, while a dream schedule, was not going to keep two college tuition, room and board bills paid for the next 2.5 years. JoJo and Hannah left in late June for Star Lake Camp in New Jersey to be program specialists at a Salvation Army camp. The 7:00 train every morning now reminds me of that melancholy day they trekked out on their own. I spent most of that day listening to Cold Play and feeling unnerved. They returned in August with amazing and valuable life and work experience. Cal moved into his first apartment in Normal in mid-August. He was immediately taken with campus life, social, academic, athletic, etc. The work load for classes was a lot more than community college, but he buckled down as always and got 'er done. His roommate Jesse turned out to be a good match and his grades for first term were even better than he expected. Around August I helped Adam fine tune his resume for a mental health job in the Illinois prisons. He was hired rather quickly, but for unclear reasons, the job has not yet started. He has been into the women's prison he was assigned several times, but has not been given a start date. I got to visit Betsy in Clarksville three times this year. We rang in the 2014 New Year together, I drove down between jobs for a long weekend, and we had a mini family reunion there over Labor Day before Megan left for college in England. That was about it for my travels. I cleaned a couple of houses until I was offered an additional day at the hospital, precipitated by my looking into another part time social work position I was told about. I am finding four days just about right, as they are jam packed, full on, intense work days. Dad was hospitalized after Thanksgiving for a severe infection in his toe/blood, and is still being nursed back to health by my mom. I help out when I can and fill in for their cleaning lady when she is injured or sick (which is most of the time lately). When she is well, I have been helping Mom "down size" her belongings. My relationship with Pat has grown as the house has emptied. The upside to working until 6:00 is that Pat has become a capable cook. I love coming home to dinner on the table. I am able to express myself better, we joke around and find each other's humor enchanting, and have discovered a closeness that comes from knowing someone so long and so well. As you may be able to tell I wasn't able to focus on much this year besides work. I think, hope and pray I have found my niche, and that 2015 will be the very best year yet.